From every angle; the modern traditional design of the Benwick Collection shines through. Offered with two table options ? 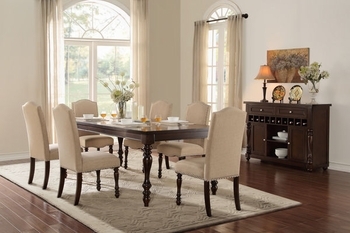 a classic turned-leg table and a display base counter height table. Each table is flanked by elegantly designed fabric covered chairs that are supported by turned dark cherry legs. Nail head accenting furthers the chair?s modern traditional styling. The accompanying server features ample behind door storage; wine bottle rack; and brushed nickel knob hardware. Birch veneer is used throughout the collection and is enhanced by a dark cherry finish.